Rural History is well known as a stimulating forum for interdisciplinary exchange. Its definition of rural history ignores traditional subject boundaries to encourage the cross-fertilisation that is essential for an understanding of rural society. It stimulates original scholarship and provides access to the best of recent research. While concentrating on the English-speaking world and Europe, the journal is not limited in geographical coverage. 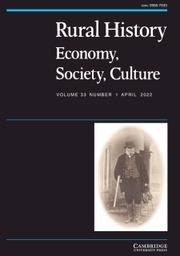 Subject areas include: agricultural history; historical ecology; folklore; popular culture and religion; rural literature; landscape history, archaeology and material culture; vernacular architecture; ethnography, anthropology and rural sociology; the study of women in rural societies; relationships between the urban and the rural; and the politics of rural societies. The journal accommodates varying disciplinary reference systems, and publishes book reviews and review articles.